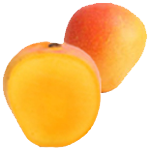 People call me Mango but I was named Mangifera Indica by scientists because I am a native of India. I am the National fruit of India, Pakistan and the Philippines. 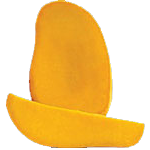 Hundreds of mango varieties have been cultivated in the Indian subcontinent since thousands of years. The most popular varieties are the Alphonso, Banganpalli, Kesar, Langra, Chausa, Sindhri, Anwar Ratol and Dussehri. From the Indian subcontinent, I have spread worldwide, mostly in the last 200 years. Popular varieties in the Americans are Kent, Haden, Tommy Atkins and Keitt. Australia is popular for Kensington Pride, whereas Thailand is popular for Nam Doc Mai. 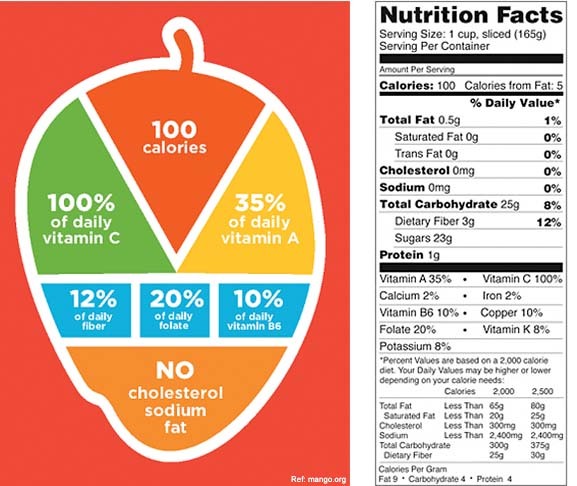 How a new mango variety comes about can be complicated. A flower on an Alphonso tree will bear Alphonso mangoes. 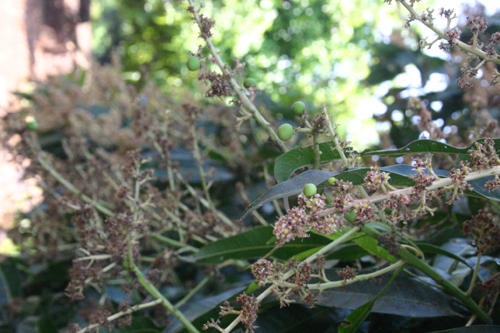 However, all seeds from this tree might not grow up to be Alphonso trees. Why? Because of genetics- depending on which varieties participated in pollination, new varieties can form. Infact, some of the most popular varieties are chance seedlings, which became popular with time. For thousands of years, my species has propagated through seeds. In the last 500 years, the technique of grafting came about and this has changed mango cultivation forever. Using this technique, the modern cultivars of mango were created and now farmers can predictably grow trees of the chosen variety by grafting them. Using grafting it is possible to grow multiple varieties on the same tree. Most of my varieties have a single seed, but some have multiple seeds too. 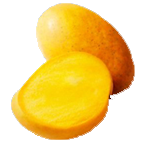 The Indian and American mango varieties are single-seeded (mono-embryonic). The Indian varieties typically have abundant flowers every alternate season- they also tend to be very sensitive. Compared to this, the American varieties flower regularly every season and are less sensitive. 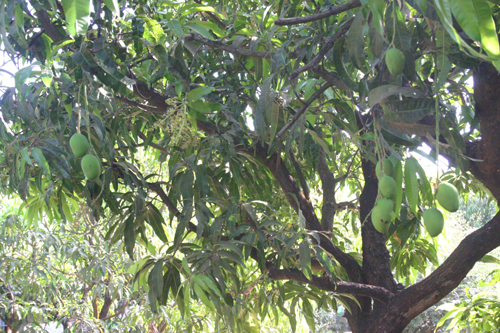 Interestingly each mango tree has a distinct character, taste and flavor. There are alpha trees, which give great fruit, irrespective of how they are treated. Then there are other trees that will scarcely yield decent fruit. At the flowering stage other than pollination of the fruit, a lot more is happening. Certain flies and pests have good knowledge about the nutritional value of the mango. They lay their eggs on the mango fruit- later on the larva goes into the fruit and burrows out when it is ready. 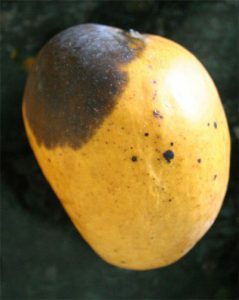 If fungal spores are present in abundance, particularly during flowering due to unexpected events such as premature rain, they can get embedded under the mango skin. 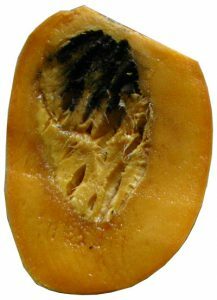 When the fruit softens up during ripening, fungus becomes active and this can spoil the fruit. 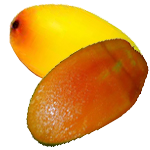 Other type of fungi become active under lower temperatures, so a mango can never be safe from fungus. Nutrition is very important to my development. An organic diet is the most balanced since it includes necessary trace elements that are vital for developing taste and immunity. This makes me strong and taste more wholesome. Modern fertilizers can make me big due to an excess of size-enhancing nutrients, but not strong as these are not rich in trace elements. This makes me vulnerable to disease, so I get sprayed by pesticides whose dosage keeps increasing every year. This is a vicious cycle- I wonder when I will get out of it!! My development is affected by weather. If the weather is inclement when I am forming into fruit, I get stressed out and cannot travel well- under stress, I also mature quickly. If there is hail when I am growing up, I can survive but the hail marks can show up when I ripen. This is more prominent in sensitive varieties with thin skin (such as in Rasalu). Good orchard owners harvest me from the tree when I am 75-80% ripe. If I develop a problem, I generally fall down the tree pre-maturely. After I am harvested, I am still living. I get cleaned properly and packed in special boxes to protect me. Different techniques, such as hot-water treatment, hot-vapor treatment and irradiation are done to kill any pests or bacteria. A lot of activity happens inside me as my starch is converted to sugar. Generally speaking, if I am sour when unripe, I will be sweet when ripe. My system has complex capillaries which transport nutrients around the tissues as I ripen. I need ideal conditions of temperature and humidity for ripening, which depends on my nature and variety. Many experts put me away for sometime in rice-husk for proper ripening. I release ethylene gas and heat during ripening which further accelerates the ripening process. If my capillary system is damaged due to any reason, I might show bruises later and not ripen well. The Indian varieties are complex flavors and are very sensitive. They need to be given the loving care of a child to develop normally. If I am the King of Mangoes- Alphonso, I am extra sensitive and if put under stress, I take immediate action and can start preparation for germination by sucking out nutrients from surrounding tissue rendering it spongy and lifeless when you cut me. I do hear the subsequent painful cry of human agony which gets bounced around the supply chain, but I cannot help it as that is just me. Other varieties don’t develop spongy tissue, but they are equally sensitive. Also, since the Indian varieties are high in sugar, watch out for fungal infection- a fungal infection can engulf me quickly and turn me totally black within 24 hours due to the high sugar content. When I am in transit, fruit handlers try to slow down my ripening by decreasing transit temperature. But they have to be careful not to go below 55F, otherwise, I develop chill injury. I suffer tissue deterioration above 100F. After cold-chain handling at low temperature, for me to realize my full potential, I need to be nurtured back to health for my ripening to restart normally. What is missing is knowledge about how to nurture me back to health. I should be kept in a ripening-conducive environment till I am ready. Think of me as a living thing- if you choke-me, heat-me-up-too-much or cool-me-down-too-much you can affect my health negatively and potentially kill me. If I am ripening well, my touch will be full of life otherwise I can feel lifeless or even like a dead body. Try holding me in your palm and feeling me- and you will feel my joy or my pain. If I am ripening normally, I will feel warm since ripening is an exothermic process which releases heat. If I am joyful and ripening well, I will also make you joyful. I will smell and taste good. Any foul odor betrays problems in my development, so you should troubleshoot accordingly. I exist to alter the consciousness of human beings who have tasted me in all my glory. I am after all the fruit-of-the-Gods in the service of humans. Year after year, I satiate human souls and dent human pride. I bring friends and family together for good times and I make people appreciate the true delights of living. I live for humanity and am the most consumed fruit in the world in my pristine form. *This article was written by Jaidev Sharma for the website mangozz.com and is protected by copyright. To reproduce the article or to embed a link to the article please take permission from zzmango.com.